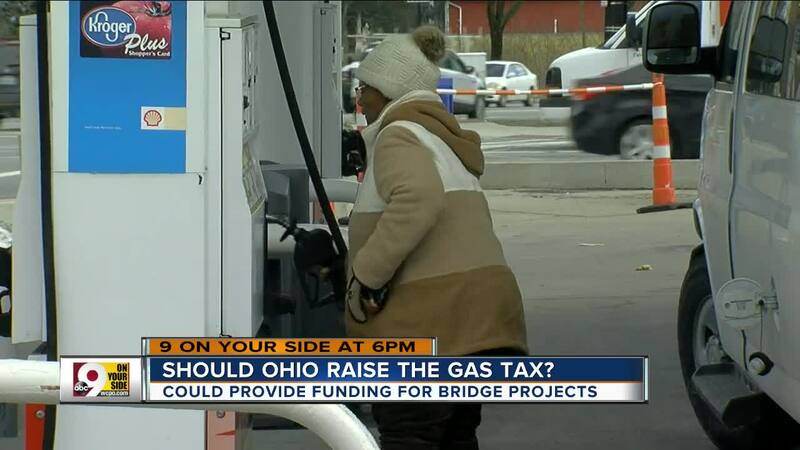 Would you pay more at the gas pump if it meant safer Ohio roads and bridges? Would you be willing to pay more at the pump if it meant a new Western Hills Viaduct? Or how about finishing the decade of construction along Interstate 75? Would the extra cost be worth it if it meant less congestion on the Brent Spence Bridge? Ohio lawmakers and transportation officials are facing a big infrastructure problem. Like, a $1 billion problem. Budget projections estimate the state of Ohio will have $1.1 billion less to spend on new road and bridge projects in 2020 than it did six years prior in 2014. That means they aren't sure how they'll pay for some new construction projects like the final phases of the Mill Creek Expressway, the Ohio-side approach to the Brent Spence Bridge, and the crumbling, 86-year-old Western Hills Viaduct. The looming funding shortfall has prompted a coalition to form within the last month -- Fix Our Roads Ohio. Increasing the "motor fuel user fee" -- that is, a fee added to prices at gas station pumps -- is the first solution FOR Ohio proposed in a report released earlier this month. Other solutions include an alternative fuel vehicle fee -- that is, a fee on electric or other alternative fuel vehicles -- and finding a dedicated funding source for improved public transit that, if executed properly, would reduce the state's dependency on single-occupancy vehicles. It also has prompted newly-sworn Gov. Mike DeWine to form an advisory council on transportation and infrastructure. The Ohio state gas tax sits at 28 cents per gallon, lagging behind four out of five neighboring states' gas tax rates. Michigan, Indiana, Pennsylvania and West Virginia all top Ohio -- Pennsylvania actually charges the nation's highest gas tax rate, at nearly 59 cents per gallon -- while Kentucky trails Ohio at 26 cents per gallon. The last time Ohio increased its fuel tax rate was in 2006. Ohio was able to avoid this shortfall once before, in 2012, when then-Gov. John Kasich approved bonds issued against turnpike toll revenue, primarily generated in the northeast region of the state. That funding will run out by the end of this year. That means Ohio needs a new source of money for new road and bridge projects, said Mark Policinski. He heads up the Ohio-Kentucky-Indiana Regional Council of Governments, one of several regional bodies responsible for dolling out state and federal grant money toward transportation and economic development projects throughout the Tri-State. He said an increase in the state's gas tax is just one of multiple solutions that need to be considered together. "Over the decades, Ohio has found a way to fund its roads and its bridges without relying on the gas tax," he told WCPO. "Other states rely more heavily on it. So, it's just a different philosophy, if you will, in taxing and how you raise money for roads." Policinski said the bureaucratic process of implementing road and bridge projects needs to be streamlined before Ohio's legislature puts a new funding mechanism -- like an increase in the gas tax -- in place. "The most important thing that needs to accompany any increase in the gas tax -- and I would argue has to go before we increase the gas tax -- is: How do we streamline the process? The federal process for building infrastructure in this country, though it's been improved recently, is still very inefficient," he said. Others, though, say boosting the gas tax is Ohio's only option. "We keep trying to find these alternative funding sources, and they're just not there," said Thomas Balzer, CEO of the Ohio Trucking Association. "The fuel tax is the best source of funding to do this. We prefer a fuel tax increase over tolling. We prefer a fuel tax increase over all the other funding sources that are out there." Ohio is a big state when it comes to moving goods throughout the country, Balzer said. More than 60 percent of the U.S. population lives within a one-day drive from the Buckeye state, putting Ohio in the nation's top five for receiving and shipping freight. Add Amazon Prime's headquarters in Hebron, Kentucky, to the regional mix, and the condition of the Tri-State's roads and bridges quickly becomes a national concern. That's why Policinski and others ultimately blame the federal government for failing to chip in on major infrastructure projects like the Brent Spence Bridge. "The demands on infrastructure are growing dramatically, and the federal government has essentially taken a powder when it comes to dealing with the issue," he said. "By doing so, they put tremendous pressure on the states. States don't have the resources that the federal government does." The federal gas tax rate was last increased in 1993. Most recently, the federal government extended that rate through 2023 when Congress passed the FAST Act in 2015. FAST stands for "Fix America's Surface Transportation." As for how this could affect prices at the pump, AAA Cincinnati spokeswoman said any gas tax increase would roll out incrementally. "If a gas tax enactment does come for Ohio, consumers will not immediately feel the impact. Most retailers phase it in over time," she told WCPO. "You won’t see, oh my gosh, you’re paying 10 cents more today than last week. It will be phased in over time." For Policinski, the lack of money for roads and bridges is a matter of public safety. "The real issue is on our safety. So these are very powerful, negative impacts by Washington simply walking away from the problem," he said. All through 2019, stay with 9 On Your Side for special coverage of topics dealing with growth and transportation. We're calling it "Move Up Cincinnati." We have a team of reporters covering this topic on-air and online at WCPO.com. SEE more of our Move Up Cincinnati coverage here.